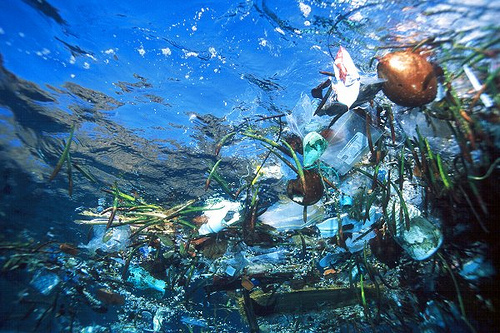 Project Kaisei and Covanta Energy hope to process nonrecyclable plastic waste from the country-sized garbage patch in the Pacific and convert it into diesel. There is nothing new or good about the Great Pacific Garbage Patch (aka the Pacific Trash Vortex), a country-sized mass of plastic debris in the North Pacific Gyre. But Project Kaisei and Covanta Energy hope to bring a positive spin to the problem with a partnership that could eventually process nonrecyclable plastic waste from the garbage patch into diesel fuel. The collaboration between Kaisei, an ocean cleanup initiative, and Covanta, a renewable energy company, was brokered by the Clinton Global Initiative. Both organizations are members of CGI’s Rethinking Waste subgroup, which works on creative solutions to waste management. Covanta and Kaisei’s partnership is in the developing stages, mainly because of technological and financial roadblocks. Kaisei is planning an exploratory mission to the Plastic Vortex for marine debris research, but the organization still needs more funding. And Covanta’s plastic-to-diesel technology isn’t ready for commercialization quite yet–the company is testing it at a pilot facility in Massachusetts through the end of the year. While a joint Kaisei and Covanta ocean expedition may still be a few years away, Covanta’s technology could be used elsewhere in the meantime. “The beauty with this technology is that once it’s shown to work, it can be used around the world in any kind of waste management capacity. There are whole coastal communities that are contributing to this [plastic] problem,” says Douglas Woodring, Co-Founder of Project Kaisei. a demonstration of a conversion to our diesel substitute,” Gilman says.